This report examines the role played by social media within the rapidly changing landscape of customer service. It was commissioned by Natalie Cowen, Head of Brand and Communications, first direct and created by Dr Andrew Currah. It seems that many companies haven't changed the way they manage customer service in line with this - Dan Bosomworth summarised a survey in the autumn last year suggesting that 95% of customer Facebook posts were ignored by brands. We’re alerting you to this new report, since if you’re managing how social media is used to deliver customer service in a business it helps give a structure to changes needed as part of the move to “Social CRM” as it is often termed today. make themselves more visible, especially when public crises occur. provide all employees with the training, tools and authority to engage with customers. look beyond standard metrics to the value of brand loyalty, advocacy and a sense of community. 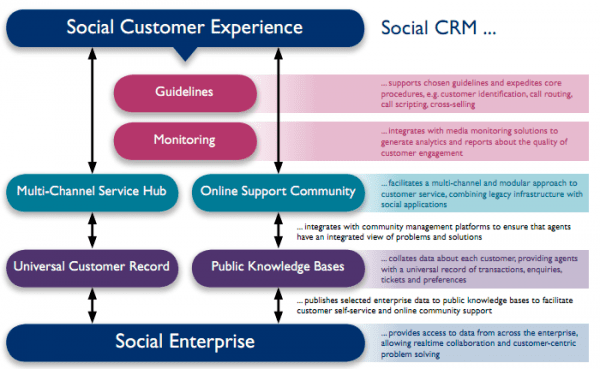 The customer service operation is equipped to monitor and engage with a targeted spectrum of media. Companies fully understand where, why and how their customers are using social media before making any changes. A balance is struck across different types of media - telephone, email, web, social and mobile. The power of online communities is recognised, and customers are encouraged to help each other. Relationships are nurtured with advocates who wield particular influence on the Internet. The report has been made available to share via Scribd. This include a more detailed 10 point plan to setup and implement better ways of working. The only thing I would add is that the opportunities to use social CRM to learn about new product/service requirements, develop advocacy aren't emphasised. Need help with your Customer relationship management? The four key types of customer data for marketing or... how valuable is knowing my customers pet's name? Is your business equipped to offer customers personalized experiences across multiple channels? In the era of instant communications and instant gratification, relationships between businesses and customers are changing. Driven by customers’ need for personalized and seamless interactions, brands are constantly ….. Discover your top customer experience (CX) issues quickly How do your customers, both current and prospective, really feel about the experience they’re having with your brand? How can you best measure this? In this post, I share three cost-effective analysis …..
Three ways financial services companies are leveraging AI to enhance the customer experience Artificial intelligence is having a transformative impact on industries and sectors across the world. From retail to manufacturing, advanced AI technology has already changed how we interact …..